We’ve been really lucky with our accommodation so far. We always look for budget places, trying to spend around $120 NZ per night. The London hotel was a bit dingy and on the “lower ground floor” but brighter light bulbs would probably have fixed most of the problem. Last night in Skipton was pretty good, the Craven Heifer Inn was set on its own out in beautiful countryside with great views good food and beer (I had a pint of Hettons Bitter) and great view from our room. The breakfast room was really lovely with the sun shining in and delightful original watercolours of local scenes on the walls. 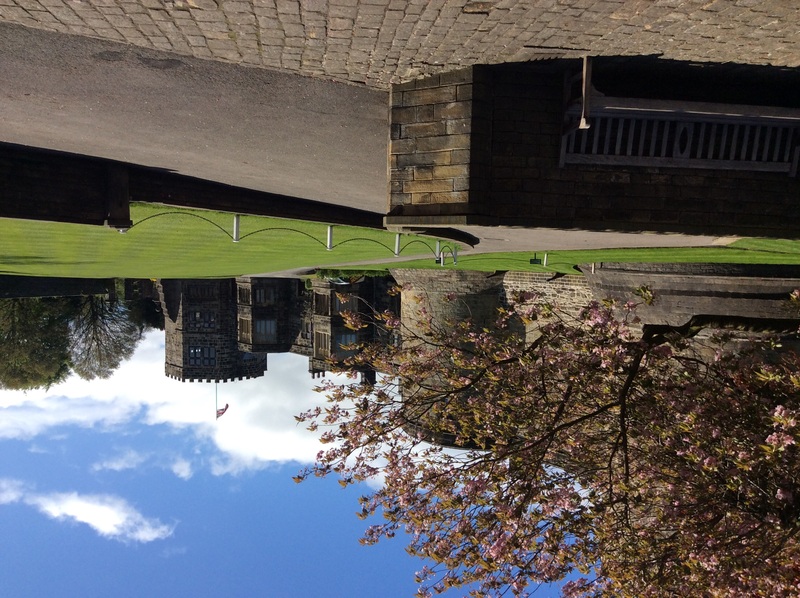 The sun was shining and the wind had dropped when we started the day at the market in Skipton before visiting the castle which is much more intact than most, in fact one end of the building is still occupied by the owners. Our trip has had a few highlights so far but this is another lovely place with manicured grounds and beautiful trees, some in blossom, framing the stone buildings. Next we drove to Ilkley which was a bit posh for us but we went for a walk on the moor up past the Cow and Calf rocks and on to the tops. Our fitness must be building because the steepish up hill stretches seemed to go without too much heavy breathing. 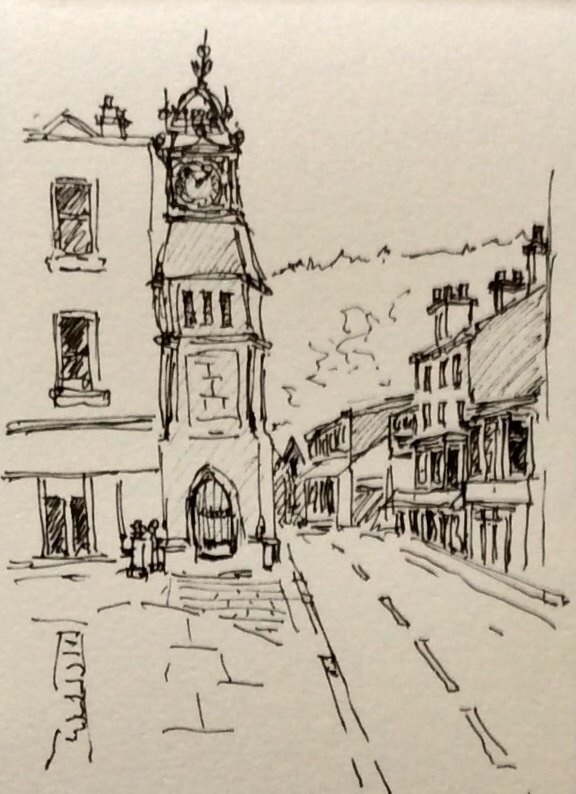 Getting back to our car after ninety minutes or so we set the GPS for York stopping in Otley where I managed the quick sketch below while Paulette wandered and visited charity shops. Walking back to the car we stopped at a donkey sanctuary shop where I picked up a tea towel as a gift. On to York where we parked at our guest house and walked to the Minster stopping for a cup of tea and a sandwich at a slightly eccentric cafe in Gillygate. James, jet and the jugular. Loved the photo of the castle, and your sketch. Your overnight stopover in Skipton sounded very attractive, with the original paintings etc. Enjoying your chat Quilliam. Ngaire, Rosie and I are now back from our week in Waikawa…lousy weather but it didn’t really stop the girls from doing anything. We did a couple of small paintings of Ngakuta and Rosie did an excellent sketch for my visitors book. We all enjoyed our day painting ceramics (Mary came over from Nelson again – she is such great company!) and can’t wait to see the fired work! Gidday to Paulette.